There is an average of six million car accidents per year in the U.S. alone. If you're in a car accident, the sudden shock might leave you wondering what to do right after it happens. However, if you follow the proper steps and precautions, you can ensure the best possible outcome. Read on for our top 15 steps you should follow after being in a car accident. Unless your immediate safety is threatened, you need to stay put for a moment. Before you do anything further, you need to thoroughly examine yourself and see if you've sustained any injuries following the car crash. If you're seriously injured, called 911 immediately or ask someone else to call. Do not move until medical personnel arrives. If you've confirmed that you're okay after being in a car accident, the next thing to do is check on all other parties involved. First, check out all the passengers you have in your vehicle. Seek medical help immediately if anyone needs it. If anyone is complaining of a neck injury or is unconscious, do not move them unless their immediate safety is threatened. Once you've accounted for yourself and your passengers, step out of the vehicle and go check on the other car(s) to make sure everyone is okay. Again, seek medical attention immediately if anyone is seriously injured or unconscious. If it's possible, move your car out of the way of traffic so it doesn't create a hazard for other drivers on the road. Once you've accounted for the car, get yourself and your passengers to safety in order to avoid any further accidents or injuries. Get to a sidewalk, median, or any place safe that's away from the road. If you're in a car accident, no matter the severity, it's extremely important to stay put until the entire process is complete. Even if you're running late or need to be somewhere, be sure to remain on the scene. It's in your best interest to stay exactly where you are until it's deemed appropriate to leave. 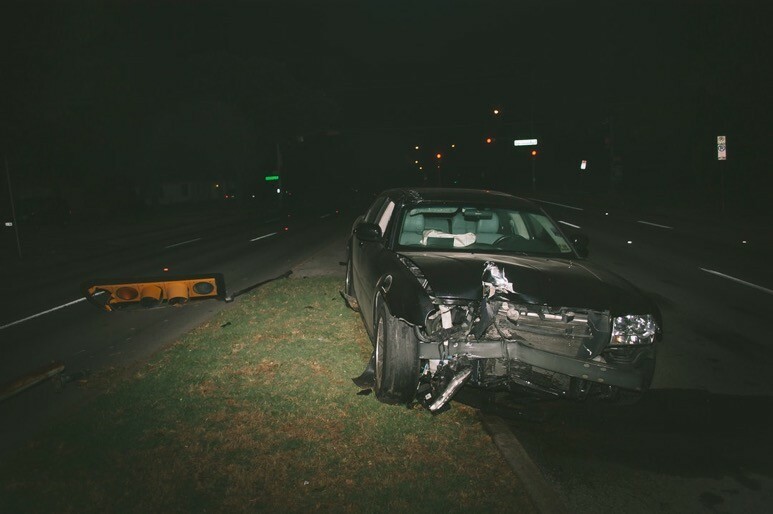 Not only will this ensure that you get all the details, but it also protects you from being incriminated as a hit-and-run driver if any of the other parties have sustained injuries or serious property damage. Never drive away from the accident scene, no matter how minor it appears to be. If you get in a car accident, your car may be creating a hazard for other drivers on the road. If it's possible, move your car to the side of the road or somewhere else away from traffic. If not, turn on your hazard lights and set up emergency flares if you have them. If it's dark out, set up flashlights to make yourselves highly visible to other drivers that might be passing. That way, you can safely wait on the scene and preserve the evidence until authorities arrive. Every accident, no matter how minor, should be followed by police involvement. In fact, this is legally required in some states. Once they arrive, the responding officer will create a complete, detailed report on the car accident scene, the drivers involved, and what happened. They will also document the scene for you, which can help you face legalities down the line. If the police do not send a responding officer to the scene, report to your nearest police station as soon as possible to file a car accident report yourself. Your insurance company will likely require it after you've filed a claim. No matter how tempting it is, do not make any admissions of guilt after being in a car accident. An innocent apology can later be used against you to make you appear completely liable for the accident. Try not to discuss the accident details with anyone else but your attorney. If the other party's insurance provider calls them, do not agree to an interview. Instead, direct them to your lawyer or request they set up an interview with your insurance company. For your personal records, make a thorough account of what happened before, during, and after the accident. Write everything down in one place so you have it ready if you need it. Identify the responding police officers. Record their name and badge number for easy contact in the future. Get a copy of the accident report. Ask the responding officer if you can have a copy of the report they file for the car accident. This will likely be requested by your insurance company after you've been in a car accident. Get the information of all parties involved in the car accident. Record their names and addresses in case they need to be contacted by yourself or your insurance company. Having a thorough record of everything and everyone involved in a car accident can really help you in the future. It creates a hassle-free information base for you to provide to your insurance company, the police, and your lawyer as the case progresses. Along with a detailed information report for yourself, take lots of pictures to document the scene. These can be very useful when you're filing an insurance claim or conferring with your lawyer in the future. Begin by taking pictures of the damage done to both vehicles. Account for all scratches, dents, and broken glass resulting from the car accident. Make sure the pictures are clear and avoid using flash if possible. If you or your passengers have sustained injuries after being in a car accident, be sure to photograph these as well. The pictures you take will likely be requested by your insurance company as well as your lawyer following the car accident. If you see any bystanders or people that came to assist after you been in a car accident, record their names and contact information. Ask everyone what he or she personally saw and keep track of the details. It may also be useful to ask anyone who's local to the area if they've seen repeated accidents occurring near that area. If you've been in a car accident, it's important to let your insurance company know as soon as possible. Be honest and give a thorough explanation of the details. Make sure you tell them exactly what happened, as any lies or confused details can severely hurt your chances of getting coverage. Get the details of the police report to your insurance company as well. That way, you'll have an account of which laws were broken by whom and who was considered to be at fault following the car accident. Even if you think you're fine, you should still be medically evaluated after being in a car accident. The rush of adrenaline you feel following the stress of the accident can seriously affect your interpretation of your own injuries. By seeking medical attention, you can be sure you're okay after you've been in a car accident. Or, your doctor will be able to identify injuries right away and get you started on a treatment plan. After you've been in a car accident, be sure to keep a record handy of all treatment you've received. This will help you file a personal injury claim and get all your expenses covered where applicable. Be sure to also make a note of your insurance claims process, including the claim number and the agent you are working with. You should have the contact information for everyone you're working with regarding the case. Finally, be sure to keep a record of all expenses you incur following a car accident. This includes receipts for rental cars and whatever else you had to pay for resulting from the accident. Obtain a copy of your car's damage evaluation by the insurance company. You may also want to take your vehicle into several automotive shops yourself and see what other estimates you can get. If there are any discrepancies, notify your insurance agent of your concerns. If you can't settle on an amount, contact your lawyer to assist you. Especially if you or another party has been injured, you should seek legal counsel as soon as possible. Hiring an excellent lawyer is one of the most important steps to take if you're looking for a favorable outcome following a car accident. Your lawyer will help you get what you're owed while fully protecting your rights. They can provide you with valuable legal advice to help you navigate through the entire process and secure the best possible outcome. If you've been in a car accident, it can be a long and painful ordeal. However, if you follow these steps, you can be sure you're responding appropriately and setting yourself up for a favorable outcome. See our directory of services to start your legal counsel today.